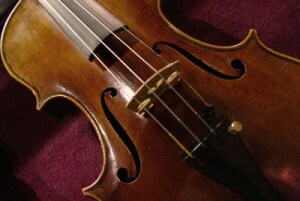 The Suzuki Violin method isn’t just a method; it’s a philosophy of music and the mind. Shinichi Suzuki, a master violinist, developed the technique after living in Germany, where he noted how easily children picked up German when immersed in the culture. He theorized that because music is a language, the best way to teach a child musicality was by immersing them in it, training their ears to recognize the beauty of fine music. This was done not just to increase their musical aptitude, but to boost their moral character; the language of music is beautiful, and being immersed in it gives one a beautiful heart. We learn to hear and speak before we learn to read and write; drawing from this, the Suzuki method emphasizes ear training before learning notation and music theory. The focus of the method is to surround the child with beautiful music, so that they learn to live, breathe and think in music, just as they might in English. Students will learn to memorize pieces, recognize notes, and eventually, to read and write music themselves. When you’re here, you’ve made it to the proverbial big leagues of formal violin training. To even join the Royal Conservatory program, you need years of training in programs like the Suzuki Method. Completion of the program is a certification of incredible technical prowess and depth of playing; those who complete the program often go on to become teachers of music themselves. We will ensure you’re ready to pass every exam before you take them. Learning at home comes with so many benefits, we don’t have space to extoll them all. Know this: when you’re at home, you’re comfortable & private, and when you’re comfortable, it’s easier to learn. For parents, this is great; you won’t have to drive a long distance to bring your child to music lessons, and you’ll be able to listen to them play without feeling intrusive. String theory is a complex scientific model that could potentially be used as a “theory of everything”; the holy grail of physics that could explain the fundamentals of the universe. The theory has by no means been confirmed, and there’s no scientific consensus around it; if there was, we’d have a theory of everything, and we don’t. That said, the premise behind the theory is quite interesting; the theory posits that these strings look like ordinary particles, but the vibration of the strings gives the particles their properties. While I don’t have anywhere near the scientific knowledge or backing to explain this theory in any kind of detail, I can tell you what it makes me think. The universe is music; the vibration of strings. That theory might resonate with burgeoning and accomplished violinists; after all, one makes music with a violin by using a bow to create all kinds of vibrations in the strings. These vibrations have been felt so deeply, one could readily argue they’ve shaped our universe; the history of Western music has been full of violins since the 1600s. Think of all the places a violin has been used throughout time; from classical orchestras to competitions with the Devil in Georgia, the violin has a storied history. Learning any instrument is about learning a new language, and a new way of thinking, and the violin is no exception. When your child learns the violin, they’ll develop so many essential life skills, it’s as mind-boggling as string theory. They’ll have to learn to read notation to be sure, as well as the tenants of music theory and history, but they’ll pick up so much more. They’ll develop an ear for music, the ability to hear it anywhere and everywhere; in the park, at school, in the home. When that ear has been developed, they’ll want to create music that reflects the beauty of the world, and they’ll have the ability to, because they’ll learn every technique needed to create exceptional pieces. Each violinist has their own style, their own flourishes that bring their subjective experience to life; the violin is one of the most powerful ways to express yourself emotionally. The dexterity required in both hands to play a piece can’t be underestimated, and the coordination, patience and discipline your child will develop is astounding. What’s more, they’ll gain confidence as they master their craft, and creativity as they learn to make the instrument their own. Emotional and rational intelligence, a creative spirit, an open, musical heart, and fleet fingers flying across the fingerboard; what more could you ask for? All of the benefits learning the violin has in store for your child can be yours, too. There’s no reason you can’t develop all of these skills at any age, and they’re always useful! Who doesn’t want to be more emotionally open, more able to see the beauty of the world? Who doesn’t appreciate learning a new language, challenging the mind to think in new ways? Who doesn’t want newfound confidence and appreciation of life? 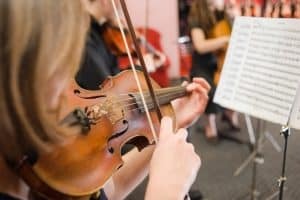 Learning the violin is an incredible way of boosting almost every facet of your life, and it’s an undertaking that can truly change your way of living.